Virgin America joined most US airlines in recording solid financial results for 4Q2014 and CY2014 – marking the first time it has reported its performance as a publicly traded company after completing an initial public offering in late 2014. The airline delivered solid top-line revenue growth in each period, but faced some cost headwinds stemming from increased salaries and higher airport costs. 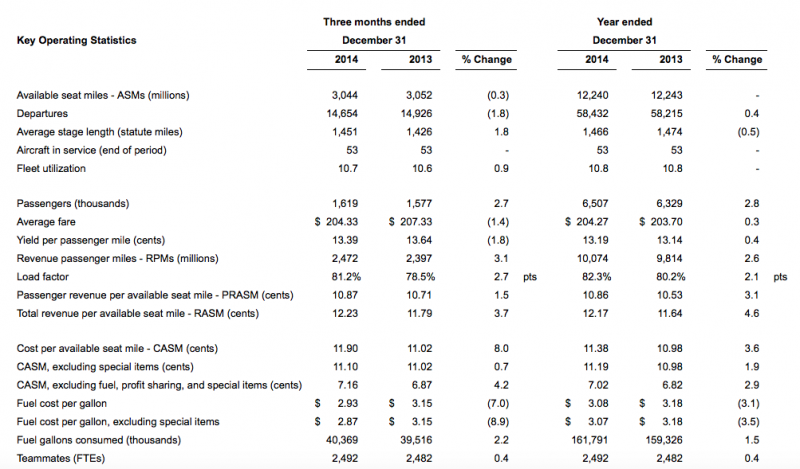 Compensation expenses will continue to pressure Virgin America’s unit costs for CY2015. Virgin America is also facing some revenue challenges in the New York transcontinental market and in Dallas Love Field driven by significant increases in industry capacity. The airline believes that those two markets should return to a more normalised state at some point, but it does appear the competitive dynamics shaping those markets will remain intact at least through 1Q2015. 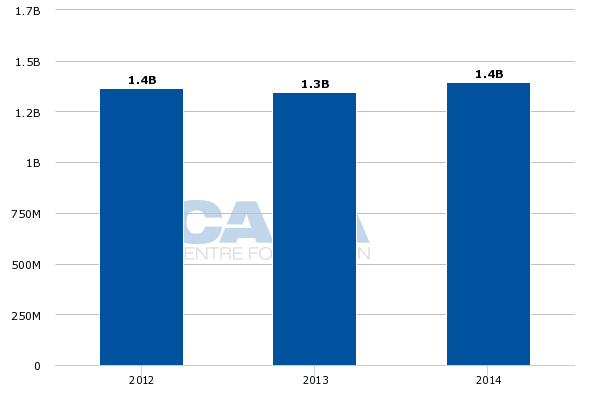 Virgin America increased top-line revenues by 3.4% during 4Q2014 to USD372 million, and grew CY2014 revenues by 4.6% to roughly USD1.5 billion. 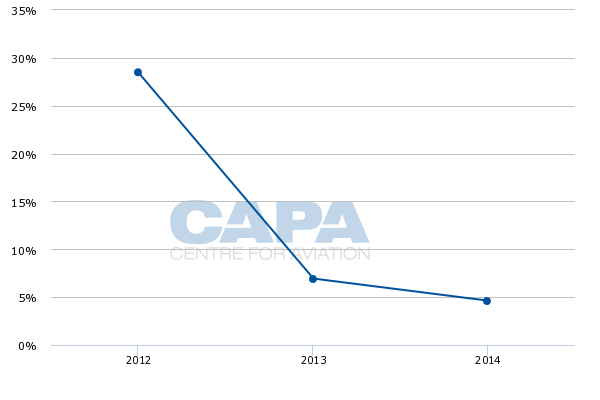 The airline’s CY2014 revenue growth was a decline from the 28.5% growth posted in CY2012 and the 6.9% increase recorded in CY2013. During 4Q2014, Virgin America increased its operating expense by 7.7% year-on-year to USD362 million driven by growth in salaries and benefits and airport costs. For the full year, the airline grew operating costs by 3.7% to USD1.4 billion compared with a 1.5% decline in CY2013 and a 28.2% increase in CY2012. Including special items of roughly USD24.2 million, Virgin America’s net income during 4Q2014 fell USD14.2 million to USD3.4 million year-on-year. Excluding those items, which include USD20.4 million from IPO expenses, the airline’s 4Q2014 net income was USD28 million. Including special items, Virgin America’s CY2014 net income was USD60.1 million versus USD10.1 million the year prior. Excluding special items, Virgin America’s CY2014 profits reached USD84.4 million. 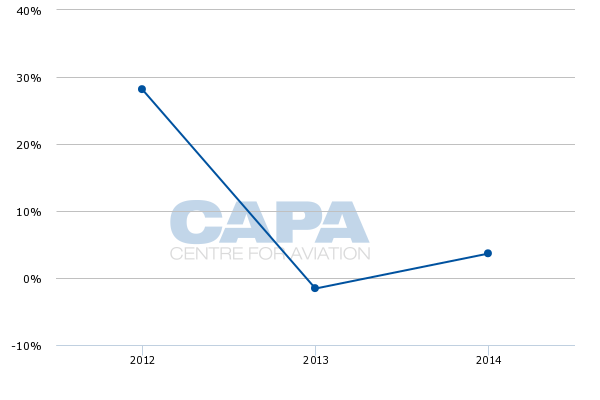 The airline’s operating profits fell from USD23.6 million to USD10.1 million year-on-year during 4Q2014, which resulted in a 3.9ppt drop in operating margin to 2.7%. Operating income for CY2014 increased from USD80.9 million to USD96.4 million year-on-year, and operating margin grew 0.8ppt to 6.5%. 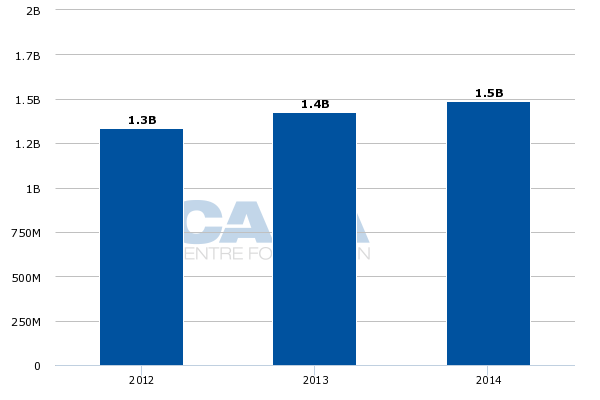 The airline’s solid performance in total unit revenues during 4Q2014 and CY2014 was driven by a co-branded credit card agreement and strong ancillary sales. Virgin America did trade in yield for loads during that each time period as its load factor in 4Q2014 increased 2.7ppt year-on-year to 81.2% and 2.1ppt in CY2014 to 82.3%. New York transcontinental routes are a significant part of Virgin America’s network, and the debut of JetBlue’s new Mint premium product on service from New York JFK to Los Angeles and San Francisco is changing the dynamics of those markets. 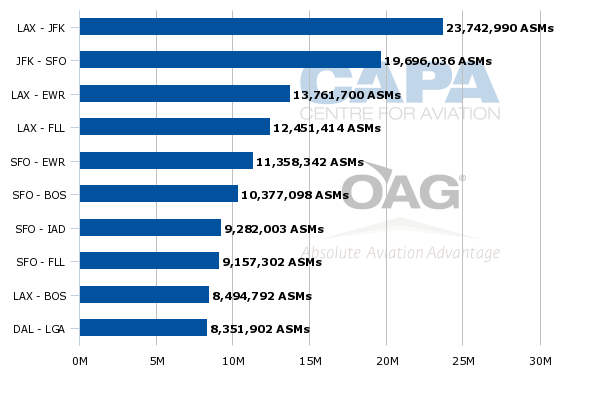 The importance of those markets to Virgin America is reflected in their stature as the airline’s top domestic markets measured by ASM deployment for the week of 16-Feb-2015 to 22-Feb-2015. Virgin America CEO David Cush recently told analysts that the New York market has been disrupted by an increase in capacity on transcontinental routes, largely from JetBlue’s introduction of Mint. Data from CAPA and OAG for the week of 16-Feb-2015 show that overall seats on offer between JFK and Los Angeles have grown roughly 14% year-on-year, with JetBlue increasing its seats by 82%. Seat counts between JFK and San Francisco are essentially flat, but JetBlue has recorded a 74% increase year-on-year. Mr Cush stated that JetBlue now has roughly 17% of the premium seats available in the JFK-Los Angeles market, and that a dilution of pricing is occurring, with average fares down roughly 30% to 40%. That has obviously created some traffic stimulation, which affects each airline differently. For larger airlines like American and Delta the stimulated traffic displaces free upgrades, said Mr Cush. “They’ve got much more exposure to it [Mint] because they’ve got such large premium cabins. On the other hand, they have some capability to react to it,” said Mr Cush. Overall, Mr Cush observed “we’ve held onto our customers, albeit at a lower fare because of the impact of Mint, and as of now we are sticking to our guns”. Virgin America’s CEO states that things “seem to be settling down in March and April,” in terms of bookings. Mr Cush also highlighted that Virgin America had the second best unit revenue performance in the JFK-Los Angeles market during CY2014, which is one of the most contested routes in the US market. Virgin America projects a passenger unit revenue performance of down 1% to up 1% for 1Q2015. One of the main drivers for that outlook is dynamics in the Dallas Love Field market, where Virgin America presently serves New York LaGuardia, Los Angeles, San Francisco and Washington National. The airline transitioned its Los Angeles and San Francisco flights from Dallas/Fort Worth in 2014 after American was required to divest gates at Love Field to gain approval for its merger with US Airways. Virgin America and Southwest were also beneficiaries of gates at Washington National that American and US Airways were required to divest. With the lifting of the Wright Amendment that prohibited certain long-haul service from Love Field, there has been a capacity storm in the market, including Virgin America’s new service. Data from CAPA and OAG show that for the week of 16-Feb-2015 overall seat levels from Love Field to North American routes have increased 38.9%, with Southwest increasing seats 29.2% year-on-year. Mr Cush stated that “if you look at the Dallas market place” capacity in some of the most important markets is up 25% to 30%. “So this is a massive increase in capacity and a massive dislocation in arguably what is a mature market.” The result is fares are at much lower levels “than anyone expected”, said Mr Cush, highlighting double-digit fares to Washington National and New York LaGuardia as an example. Dallas/Fort Worth’s largest airline American and Spirit Airlines, which also serves DFW, also cited dilutive pricing pressure in the Dallas market that is continuing into early 2015. Noting that Virgin America was only a few months into its operations at Love Field, Mr Cush remarked that his gut feeling was that the situation will work itself out. The airline is actually adding more capacity to Love Field in Apr-2015 with the launch of new service to Austin, breaking Southwest’s monopoly on flights from Love Field to the Texas capital. American also serves Austin from DFW, and combined American and Southwest presently (15-Feb-2015 to 21-Feb-2015) offer nearly 22,000 one-way seats in the market (according to data from CAPA and OAG). Virgin America may also be setting its sights on Hawaii, and believes the market holds potential from San Francisco, its largest base and headquarters. Hawaiian Airlines recently cited some revenue headwinds for 1Q2015 driven by industry capacity increased on routes from Hawaii to North America, and stated that based on published schedules capacity between Hawaii and North America would be at record levels in 1H2015, with the growth levelling off in 3Q2015. Mr Cush concluded that Virgin America has seen the growth in the Hawaiian market in terms of capacity “but our analysis right now shows that the market is absorbing that capacity quite efficiently and revenue has grown” particularly from the San Francisco Bay area. He stated Virgin America is quite bullish about the Hawaiian market, particularly given its point of sales strength from San Francisco. Data from CAPA and OAG show that for the week of 16-Feb-2015 Delta, Hawaiian and United operate service from San Francisco to Honolulu, and overall one-way seats have increased just 1.7% year-on-year. Hawaiian joined United in late 2014 with service from San Francisco to Kahului, which has resulted in a roughly 67% rise in seats on offer in the market year-on-year. Mr Cush stated that while Virgin America is making the technical preparations to serve Hawaii, the airline does not presently need to make a firm decision about entering the market, and noted the earliest start date would likely occur in Oct-2015. As it works to mitigate capacity pressure in certain markets, Virgin America is projecting a unit cost rise excluding fuel and profit sharing of 4% to 6% for CY2015 driven by increases in employee wages to align compensation with current industry averages. During Apr-2015 Virgin America is introducing increases averaging 15% for pilots and 5% for most of its other work groups with the exception of flight attendants, which are represented by the Transport Workers Union. Management and union representatives plan to commence negotiations for a collective bargaining agreement in late 2015. Outlining some of changes in Virgin America’s profit sharing scheme, Mr Cush stated that the company has created a threshold for earnings per aircraft. Philosophically, he explained the company is not only doing what is necessary to achieve profitability, but also needs to deliver an acceptable return on assets “before we share excess profits with our teammates”. He remarked that Virgin America’s labour groups understand that the company needs to ensure its investors are taken care of so the airline has capital available when necessary. Virgin America’s IPO in late 2014 resulted in some much needed balance sheet clean-up that included the elimination of USD690 million in debt. Its cash balance of USD394.6 million is roughly 26.5% of its CY2014 revenues. The airline also achieved its second consecutive year of profitability in CY2014, perhaps providing some proof to critics that its model could be viable. But as previously reported by CAPA, capacity reductions and debt restructuring prior to the IPO were major drivers in its favourable performance during the last couple of years. At the start of 2015 Virgin America faces some formidable challenges in its key markets that may linger well into the year. With the cost headwinds it faces and the potential for continued revenue dilution in the transcontinental market and Dallas, 2015 could prove to be a pivotal year for Virgin America and its shareholders.